Students were given a 250 mL volumetric flask filled with water. It was explained that volumetric flasks are some of the most precise glassware we will use in high school chemistry. When the water is filled to the line on a 250 mL volumetric, the uncertainty in that measurement is small. Each group was given another piece of glassware used to measure volume (e.g. 10 mL, 25 mL, 50 mL, and 100 mL graduated cylinders, 50 mL and 100 mL beakers) and asked to measure the volume of water in the volumetric flask to see what value they get. The post discussion around this addressed how to take a proper measurement (estimate one digit past the most precise marking on the tool) and how the precision of the tool impacts the measurement taken. Students saw that the beakers gave really poor values compared to the graduated cylinders. They recognized that the 10 mL graduated cylinder was the most precise, but there were other issues of uncertainty when using it. This activity was used to prompt a discussion about significant figures and students were given homework about taking good measurements and dealing with significant figures. In this experiment, students will explore whether making a change to a system has an effect on the mass of the system. The five mini experiments completed were melting an ice cube, dissolving sugar in water, dissolving Alka Selzer in water, combining two solutions to make a precipitate (sodium carbonate and calcium chloride were used), and igniting a piece of steel wool using a 9V battery. For each experiment, students were asked to define what the system would be and when they should take their before and after masses. Each group was given two of the five experiments, and then all data were written on the board in order to compare results. Giving each group two experiments resulted in about three trials of data for each of the five experiments. In analyzing the data, students were asked to determine if any changes in mass were significant, i.e. whether the differences could be attributed to the uncertainty of the balance or not. For the experiments where the data were significantly different, students were asked whether the change could be attributed to some other source of uncertainty or if the mass of the system really had changed. 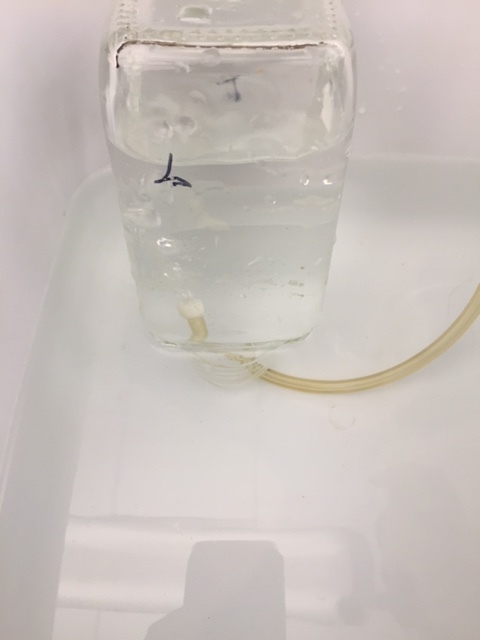 For example, the dissolving sugar saw a small decrease, but students were quick to attribute this to losing some grains of sugar in the transfer process. The loss of mass in the Alka Selzer experiment, however, was attributed to gas particles leaving the system. To wrap up, students were given an introduction to a way to analyze and categorize uncertainty. 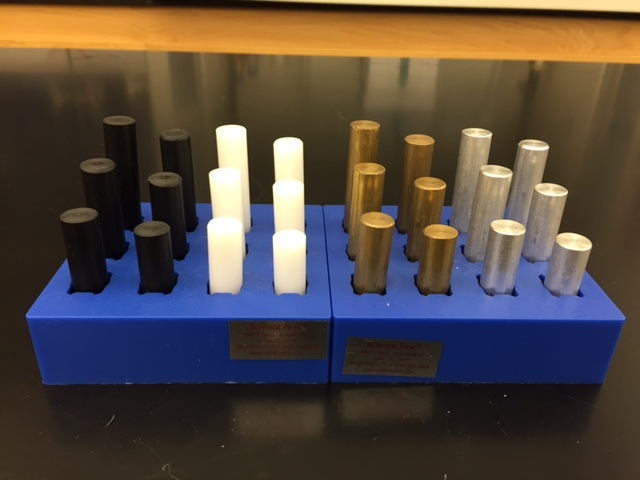 There are three categories of uncertainty: tools (the precision of the tools being used to take measurement), technique (for example, when you pour water out of a graduated cylinder, some water stays behind, so the volume measurement is uncertain), and environment (for example, in the melting ice experiment, water vapor condensed on the surface of the cold container). Students were broken into groups and given a substance to study. 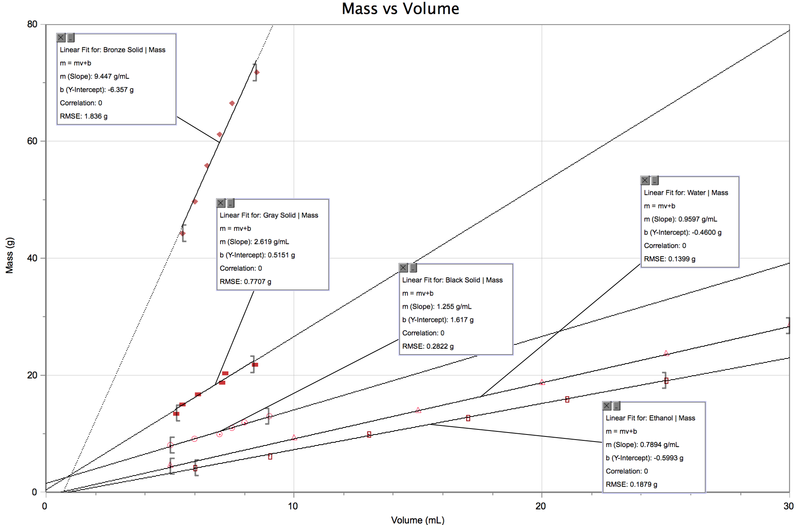 They were asked to find the mass and volume of several samples of their substance and to graph that data. Four groups were given solids (taken from this density kit) and two groups were given liquids (water and ethanol). Once all groups had collected their data, I had them input their data into one Logger Pro file so that we could look at all samples on the same graph. Most of my students come into Chemistry already having an understanding of density. They articulate clearly that density is a ratio between mass and volume, that the density of a substance is constant, and that different substances have different densities. Rather than using the post lab discussion to elicit this ideas, I asked the students first what they already know about the relationship between mass and volume. As they stated these ideas, I then turned to graph that was being projected and asked them to find evidence to support what they were claiming. The emphasis here was not to teach students about the concept of density, which they already know, but to help them start to understand how we know these things. I want them to become experts at analyzing data and making connections between mathematical expressions and scientific equations. This class period was dedicated to discussing the homework assignments students had completed so far. The worksheet that followed the mass and volume lab and relied on students understanding of density as a ratio is one that I have found challenges most of the students I have taught in other locations. My students here had very little trouble with it. However they were very much struggling with the idea of uncertainty in measurements, how to take a good measurement, how to determine the number of significant figures in a measurement, and how to complete calculations using the appropriate number of significant figures. This further emphasized to me that the content of this first unit is not the emphasis with these students, but experimentation skills, science skills, are the emphasis. Students were asked to refer back to the mass vs volume lab and compare the densities of solids and liquids. They noted that generally, solids are more dense than liquids. They predicted that gases would be less dense than both solids and liquids. To set up the lab, I explained the procedure, which involves placing Alka Selzer in a test tube with water. 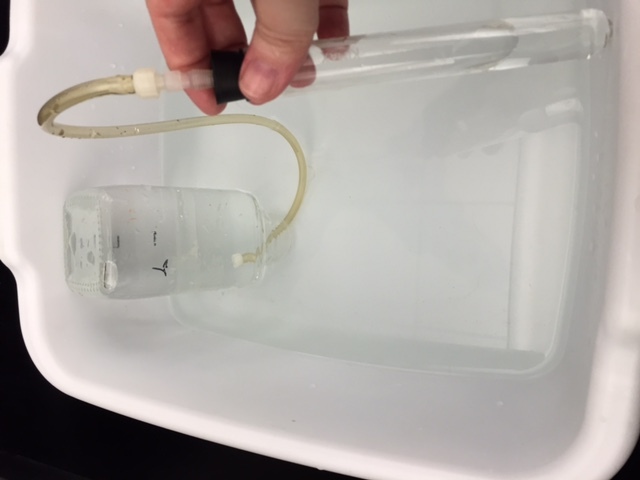 The gas escapes through a tube and into a jar that has been filled with water and placed in a tub of water. The students are asked to articulate how we might go about determining the mass and the volume. This is a complicated question for student at this stage. Many of their suggestions may seem like they would work, but would be difficult to carry out. For example, most students say to measure volume, the volume of water when the jar is full should be measured, then after the gas displaces some of the water, the remaining water’s volume should be measured in order to determine the difference, and therefore the gas volume. While this shows that they understand the idea that volume is the amount of space something takes up, and therefore the gas volume and the water volume would be the same, it also shows that they don’t understand how extraordinarily difficult it would be to extract a jar from a tub of water without the water in the jar joining the water in the tub. Again, they understand content, but they struggle with how to carry out an experiment in the most efficient and least uncertain way. After determining what measurements to take (make a line on the jar and fill with water to measure volume, take the mass of test tube, water, and Alka Selzer before and after the gas leaves), students carry out the experiment and learn that gas density is several orders of magnitude smaller than the density of solid and liquids. Having students draw particle representations of the three states of matter is a good check for their understanding. In keeping with the theme of the unit, science skills, students were asked to write about sources of uncertainty in this experiment. They must identify the source of uncertainty and how it specifically impacted the data (e.g. it made the mass reading too large, and therefore the density calculation was too large). In this activity, students were given rectangular pieces of regular aluminum foil and heavy duty aluminum foil. They were told that advertisers make the claim that heavy duty foil is 50% thicker than regular and were asked to determine the thickness of each sheet of foil in order to verify this claim. All they are allowed to use is a ruler, a balance, and their knowledge of aluminum. These students quickly determined that they could use the mass and density to determine the volume, and then measure the length and width. Using volume, length, and width, they can determine the height, or thickness of the foil. In addition to being an application of their knowledge of density and their ability to take good measurements, this activity is a great opportunity to talk to the students about the size of the particles we deal with in chemistry. The thickness of regular aluminum foil is approximately 1.6 x 10^-3 cm. Because the aluminum foil must be at least one layer of particles thick, we can accept this value as the upper limit for the size of an aluminum atom. When students were told that the diameter of an aluminum particle is 2.9 x 10^-8 cm, the note that this number is very small. However it is not until they calculate the approximate number of layers of particles it would take to make up the thickness of aluminum foil (approximately 55,000 layers) that they understand the magnitude of this number. What is a proper procedure and why is it proper? How do we take proper measurements with the tools we are using? What are sources of uncertainty in our data collection? How can we connect the claims we make in our conclusions to evidence we gather in the experiment? As the unit progressed, students’ language already began to change as they talked about experiments. They are certainly not masters yet, but I do feel that they improved in the areas of focus for this unit.